The April election is history, but there is always another opportunity to exercise your right to vote. The General Primary Election is coming up in March 2018 and the next General Election in November 2018, for the election of Federal, State and County officials. If you have not registered to vote, stop in. Registrars are always available when the Library is open. 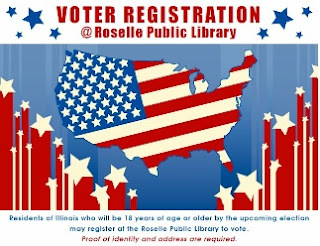 To register to vote or change your voter registration, you must be a citizen of the United States; reside in your precinct for 30 days as of the next election; be 18 years of age by election day; and bring 2 forms of ID, one with your current address. The Library is located at 40 South Park Street in Roselle. Call 630-529-1641, x *222 for more information.